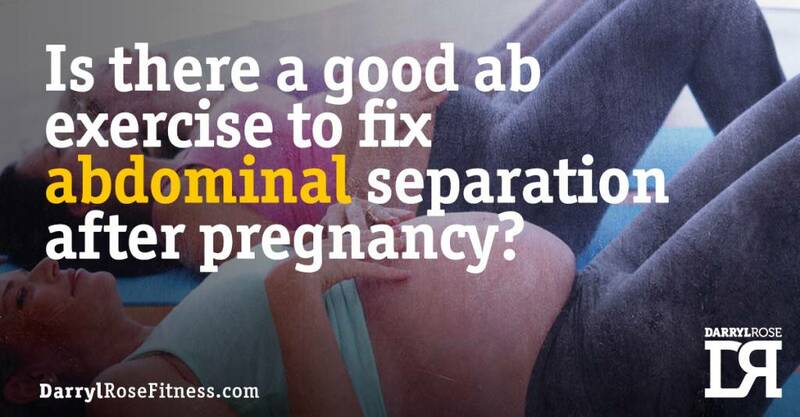 Is there an exercise to fix ab separation? In all honesty I believe the best “ab” exercise for diastasis recti is no “ab” exercises at all. It’s more important to get your PC (pubococcygeus) muscles and transverse abdominus (like a girdle) working again as well as strengthen them. Doing any kind of “ab” exercise can make matters worse by increasing your abdominal separation and I’ve seen it. Though this doesn’t happen to every woman, there are exceptions, but you may not be one of them and the last thing you want is to be one of the few who got really messed up postpartum. Back pain can sometimes occur when diastasis recti happens and is left uncorrected… Though abdominal separation is the least of your problems cause sometimes that can go away with time. The bigger issue is not having control of the deeper muscles, your TVA and PC muscles, so working on these should be a priority if you want to get rid of diastasis recti. So what do you do about that “pooch” that’s just hanging there with a soft and squishy center? Fist off you want to avoid lifting heavy things improperly, even your kids (they’re heavy too)… but that’s not really practical so you’re going to have to start working on your “core” ASAP. To do this you can perform a couple of simple exercises such as diaphragmatic breathing, pelvic tilting and bracing techniques that you can progress by adding heel slides, all of which you can perform laying on your back. This can do this a few times a day for a few minutes whenever you get the chance. A little goes a long way. Try it for a few weeks and you’ll feel much stronger and then you can progress to more advanced exercises to help strengthen your midsection and close the gap. Now for the more “athletic” mom, the one who worked out up until the last trimester, you’re strong… and you may be eager to get back to your ideal weight (which can be done safely relatively fast), lifting what you used to before you were pregnant. For the most part you can, but you need to pay special attention to the fact that during pregnancy your hips tilted and you have a little increased laxity in your joints, which can be detrimental to your spine depending on the types of exercises you choose. That being said, you can actually do pretty much everything you used to do just at a lower intensity as your body heals and realigns itself. If you want to see a supermoms experience go HERE and also pay attention to the mistakes that she made. Understand that you’ll never get your “old” body back, that’s gone forever. Your body has gone through an incredible change and now it’s about becoming the strongest version of your “new” self, which can be even leaner and more toned than before you got pregnant. If you found this article helpful, please share it with someone that you think may benefit from it.